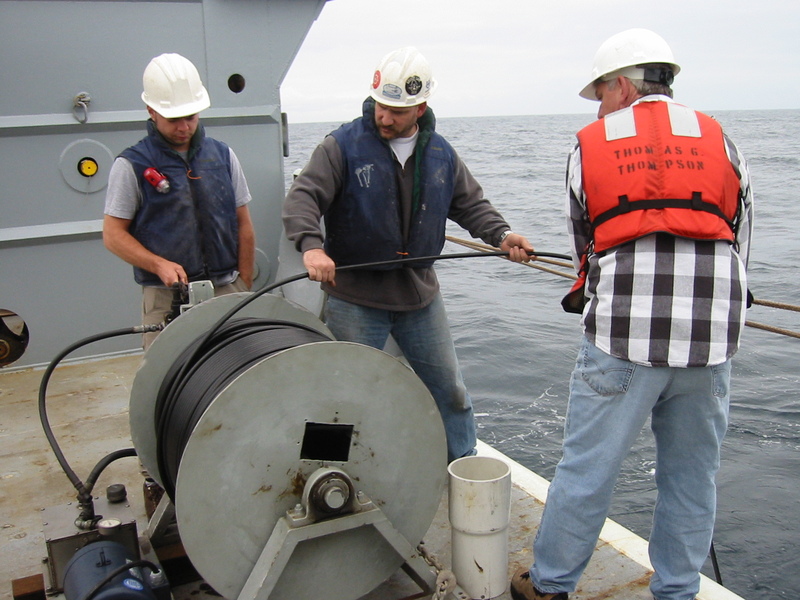 The Magnetics Group at Woods Hole Oceanographic Institution has experience in operating several different types of magnetometer sensors for use at sea. The ship-based sensors are operated by the WHOI SSSG group and these are typically of the precession-type of sensor which measures the absolute magnitude of Earth's magnetic field. These sensitive sensors must be towed quite far behind the surface ship, often 2 to 3 times the ship length. To use magnetometer sensors on deep sea vehicles another type of sensor must be used. Maurice Tivey has pioneered the use of fluxgate magnetic sensors and magneto-resistor types of sensors on deep-towed systems, on the deep diving submersible Alvin, on the Remotely-Operated Vehicles (ROV) like Jason and on Autonomous Underwater Vehicles (AUVs) such as ABE. Click on the sidebar for more information on the various sensors. The Magnetics Group also has lab equipment for rock magnetic measurements including a small portable Molspin rock magnetometer, a Bartington susceptibility meter and 3-axis helmholtz coil system.